Today we are unveiling the results of a new study about how professionals think about success: how they feel about it, define it, talk about it, and pursue it. You might be surprised by the results and ways you too can pursue your own individual path to success. Who needs a corner office when you have flexibility? When it comes to scoring the corner office, only 4% of professionals see it as a win (96% don’t care). And 86% of professionals don’t prioritize having a job their peers admire. Now it's about being your own boss – more than one-third (34%) of professionals would take a 10% pay-cut for the ability to design their own schedule. Farewell to the flashy title. It’s all about skills. Professionals today are not just in it for the title – almost 90 percent (89%) feel that skills are even more important than job titles. In fact, “learning a new skill” is the #1 goal professionals are in it for in 2018. To pursue your skills resolutions this year, check out LinkedIn Learning and explore online courses that will help you expand your knowledge bank. A problem-free philosophy = The side hustle. Two out of five professionals don’t list being passionate about their job as a measure of success – instead they’re in it to pay the bills (69%). And living problem-free is a top priority, as nearly three-quarters (74%) are in it not to worry about money. This motivation is helping to usher in the age of the side hustle. Whether it’s moonlighting in an art gallery or building websites on the weekends, more than one-third of professionals today (36%) find success in pursuing a passion project or side job. Self improvement starts with others. The majority of professionals (87%) say success isn’t just about what you accomplish in your life, it’s about what you inspire others to do. 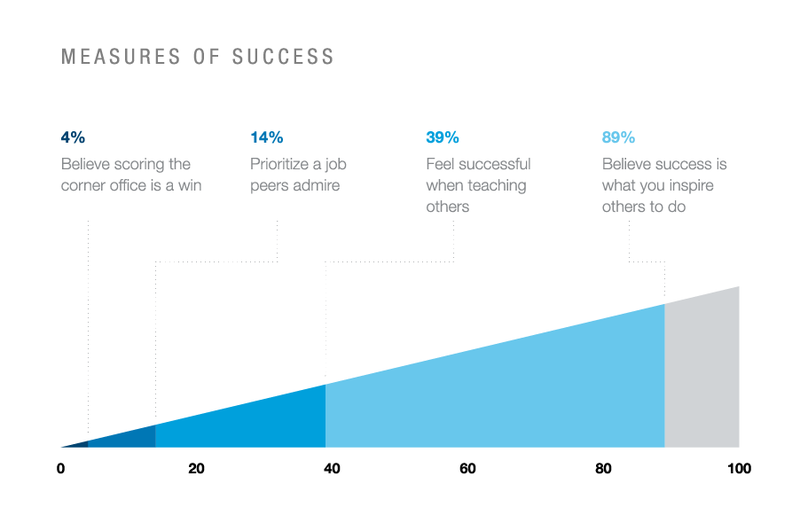 Putting this into action, nearly 40% of professionals feel most successful when teaching others. If you want to volunteer, you can check out resources like the LinkedIn Volunteer Marketplace to see how your skills align with nearby volunteer opportunities, and LinkedIn Career Advice which connects you with mentorship opportunities. One of the strongest motivators? Beating career FOMO. Almost two-thirds (65%) of Americans say they fear they will miss their opportunity to succeed if they don’t keep their options open. To beat career FOMO, it’s important to always keep your network active and constantly seek new challenges both inside and outside of the workplace. We’d love to hear your story and learn more about what success means to you – join the conversation using #InItTogether. This Harris Poll, on behalf of LinkedIn, was conducted online within the United States between November 25-30, 2017, among 2,000 U.S. adults aged 18+ who are either in permanent full-time or part-time employment or full-time self employed/freelance.